Nadine Deleury plays first cello in the Michigan Opera Theater. She writes of her musical reunification with the hero of her youth, triggered by the creation of Cyrano, an opera by David DiChiera. I never read the play “Cyrano” by Rostand, but I saw on television the superb interpretation of Daniel Sorano, and I did listen numerous times to the record during my youth. I knew all the dialogues, the voice inflections of each characters. Remembering the final scene of Cyrano “reading” Christian’s letter to Roxane in the dark, still brings tears to my eyes. When a year or two ago, there was a rumor that our general director David DiChiera was writing an opera based on the text by Rostand, I was keenly interested! 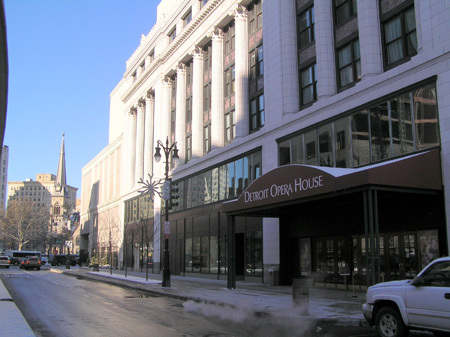 Then the rumor was confirmed: this new opera will open in Detroit, in October 2007. The composer is David DiChiera, our very own “boss”. Founder of Michigan Opera Theater, excellent impresario, friend of many singers (including Pavarotti who, graciously, came several times to Detroit. We especially had the honor to hear him at the gala concert celebrating the opening of our own Michigan opera house.) David DiChiera also has an essential quality: he knows how to approach donors in the region, companies and wealthy individuals for contributions to our company. 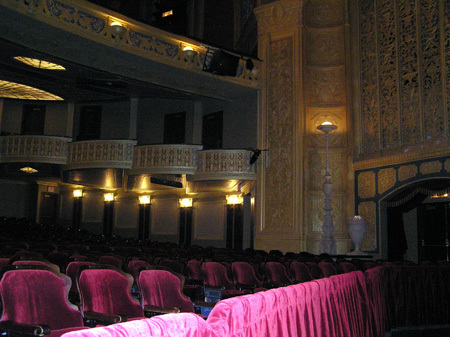 He also managed to transform an old movie theater in ruins, in the center of Detroit, into a splendid hall with excellent acoustics, an orchestra pit and a stage capable of accommodating any opera or other production. The announcement that we would take part in the creation of a brand new opera, gave us a mixture of pleasure and bewilderment. Of course, we all knew that our “boss” was a musician, but for him to compose an opera was a stretch of the imagination! To add to our puzzlement, we learned that he would not work on the orchestration; it would be handled by Mark Flint, one of our conductors. And, maybe, most importantly, the librettos would be written by a Frenchman, Bernard Uzan! An American opera in French !! DiChiera explained in a recent interview that “in reading the play by Rostand, I realized that I wanted to deepen my knowledge about the beauty of the French language which is so musical that, for me, it had to be sung”. In the end, even though we were quick to criticize the "authority”, we were quickly convinced that those decisions were sound. David DiChiera explained that, not being a full time musician, he never would have found the time to work on the orchestration, especially since the creation of the musical score had already taken him eight years. As for the choice of the language, it was clear that he was hearing the French words while he composed the music. I could not attend this rehearsal centered on the reading of the first act. Some modifications were made. The media was invited to pique their interest in this new opera. The second act is entitled “The House of Roxane” (I would have preferred “The Balcony of Roxane”, but said nothing!). I was about to hear music composed by my “boss”. If it cannot be described as revolutionary, DiChiera’s music is melodic, his harmonies are pleasant; it is influenced by Puccini and Verdi too... I really liked it and, spontaneously, went to tell him so. Then to my surprise he replied: “You will see, you have many solos!” So, these bars were written for me because the composer was familiar with my playing. In all modesty, what pleasure, what elation! I looked forward to the production of this opera in October. We will have three rehearsals, a “sitz probe” (without staging), several “piano dress rehearsals”, two dress rehearsals, a performance for students. The five public performances start on October 13th. The number of rehearsals may not seem enough for a new work of this length - three hours in total. But this is America! Some time ago, a guest conductor explained that musicians in an American orchestra are more responsive and attentive than their counterparts in France because they do not expect many rehearsals. And a friend, who plays with the Paris Opera, confided: ”We have so many rehearsals, we are bored! It’s to accommodate the conductor”. September 27: First “real” rehearsal Mark Flint, the conductor, warns me: "we'll start with the second act: the siege of Arras!” I exclaimed: “Guess what? I was born in Arras!” This rehearsal is similar to the reading of the first act we had in July since it is a first reading of this second act. David DiChiera, understandably very nervous, sits at the table looking at the score. Someone, to my left, is circling notes that will have to be corrected. I am too preoccupied with my score to judge the French accent of the singers. As we know, it is always difficult to understand the lyrics in an opera and confused spectators will have the subtitles in english on the marquis above the stage to follow the action! After the break, we are presented to the Romanian Marian Pop as Cyrano, the American Leah Partridge as Roxane and the Spaniard Jose Luis Sola as Christian. I try to picture them in their costumes and makeup! Cyrano, for the moment, has a good physique, is young and his nose is not extravagant. Improvement will be needed. October 2: Second rehearsal A golden opportunity to collect signatures from all the personalities on a giant poster to send to our friend Thomas Sertillanges for his collection of Cyrano memorabilia! A few words of explanation to everyone and they were all thrilled to indulge me, especially Cyrano (Marian Pop). I asked him about his makeup nose but he had not seen it yet. It should not be easy to sing with a fake nose but maybe he has practiced already. Seeing a plump figure, I asked: “Are you Ragueneau, by any chance? “. “ I am his understudy! I am the capuchin. This is the true Ragueneau!” (Just as round as he !). When I ask another person to sign the poster, he realizes that his name was omitted and becomes very angry.... I meet Audrey who is French. She will be the “French vocal coach” for this opera. She tells me she adores this opera and has tears in her eyes during certain scenes. “ The music is beautiful and the singers are wonderful!”. As for the first rehearsal, the singers join the orchestra after the break. I suppose they are all there. It is difficult to say how many they are, but certainly are far from the 50-some characters in Rostand’s play ! For the orchestra, correcting notes, nuances and indications of balance between instruments continues. All the singers appear very comfortable in their role and they know their score. I hear nothing but positive feedback around me! October 4: The orchestra alone Today is rehearsal for the orchestra only. The absence of the singers, as so often, makes the rehearsal a little tedious. The conductor appeared preoccupied. When I asked him how he was, he answered: “This portion is difficult for the singers.” He was probably entering the period of doubt when he wonders if we will be ready on the big day. If the work is difficult for the singers, it is less so for the orchestra, except for the trumpets! I asked my colleague, Gordy:” What did you do to David (DiChiera) that he would write such a difficult part for you?” Indeed the score is in an unusually high register for this instrument. And, if this was not difficult enough, the trumpet section must leave the pit several times to play behind the stage! One of them told me that he has to play on one side of the stage, then has 18 bars to cross to the opposite side; he is terribly afraid to take his eye off the score and miss his reentry. October 5: All together The much anticipated rehearsal where we were finally all together: the chorus and the singers on stage, and the orchestra in the pit. Bernard Uzan (librettist/stage director) approached me: "It’s you who writes for the website, Cyrano? Someone forwarded it to me!” His librettos, I realize, closely repeat the verses by Rostand with some cuts, of course, since the opera does not have all the characters of the play. I am convinced that keeping the most of the original text was a great idea -easy for me to say, since I must be the only one on the team to understand French! This rehearsal lasted almost 4 hours with only one break for an opera which will last 3 hours: sixty four minutes for the first act and some forty minutes for each of the next two. I must say that the conductor did not lose one second of the rehearsal time. During the last stretch, when he asked, one last time, how much longer he had for this rehearsal and was told: “25 seconds, Maestro”, he told us: “OK ! Take up at the 304 bar” which we did to play two notes! I felt a sense of camaraderie among the singers; they had fun teasing each other and were very comfortable with their scores. The three main characters are very young and have extraordinary voices. 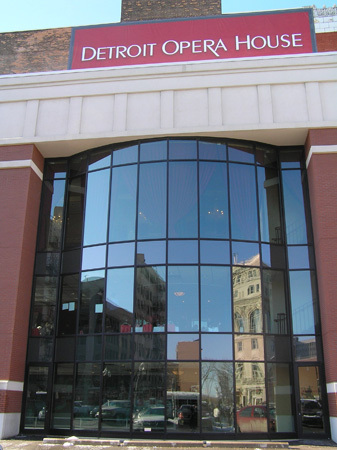 I thought about the composer, David DiChiera: in 36 years, as the managing director of Michigan Opera Theater, he has been through many stressful situations, but, this time, he must have experienced the stress in a particularly personal way. October 8: First dress rehearsal I entered the room reserved for musicians and encountered the five colleagues who will play on stage just before Montfleury is forced to flee under sarcasm. 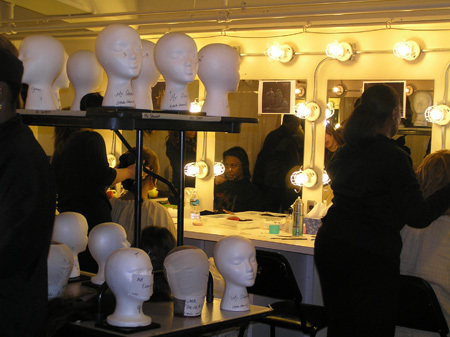 Here they are in full regalia, wigs and makeup! I told the cellist that he resembled Gerard Depardieu in “All the Mornings of the World”. Eaves dropping or bluntly asking my colleagues for their opinions, the verdict was unanimous: our Cyrano will be a success. We were familiar with the music and the voices, now we discovered the costumes and stage sets which filled the entire surface of our spacious stage. They were wonderful! At curtain time, the audience will be dazzled and will experience the spectacular lighting as if orchestrated by Rembrandt himself. Earlier rehearsals were devoted to the music and the movements on stage; the singers were not concerned with their dramatic intensity. That day, their transformation was evident; they were in character. Leah Partridge was now blond, very slim and flirting, “ravishingly charming”. Marian Pop appeared thin under the disguise of Cyrano and not as handsome with a nose “that precedes him everywhere by a quarter of an hour”. The opera begins with a very short prelude, then the curtain rises and we see the Hotel de Bourgogne. I was very tempted to look at the stage, especially since my position in the pit gave me a perspective that my colleagues could envy. But a musician must follow the conductor’s baton in order to not risk the shame of being reminded the famous quote from a renown conductor: “If you want to watch the show, buy your ticket!”. I admitted, however, that by looking from the corner of my eye and assisted by the excellent French pronunciation of the singers (Audrey, bravo and thank you! ), I could follow the story, the dialogues, even anticipated them. Hopefully, no one will expect me to be first cellist and prompter simultaneously! The “Tirades of the Noses” was demanding for me; my score was filled with many notes! This was perhaps why I had not been (yet) very impressed with the bravery taking place on stage. On the other hand, the last scene was memorable. When Roxane asks, affirming rather than questioning, “these tears were yours?” and Cyrano replies, “that blood was his”, I felt the same emotion I experienced years ago while listening to Daniel Sorano and Françoise Christophe. The music is extremely beautiful and I was not the only one to feel this way; a violinist told me that she “almost cried, it was so beautiful and sad”. Walking back to my car accompanied by a singer, he confirmed that the final scene was really good. We agreed that this rehearsal was incredibly successful, in a relaxed atmosphere, or at least, it seemed relaxed. He added that Bernard (Uzan) was annoyed by a few details, ie. a cart was not in its place or someone was not wearing his hat, which seemed to me minor mistakes considering such a production. But it reminded me of a dress rehearsal of Rostand’s play. It is said that he had donned a costume himself and, mixing with the extras on stage, he encouraged them and resolved final details! He would not have tolerated, either, a hat forgotten backstage! This rehearsal ended like the last one; the conductor asked us to return to the beginning of a score for the last ten remaining seconds. He cannot be accused of squandering the company’s money! October 9: Dress rehearsal with piano Yesterday, I wrote that I could see part of the performance on stage due to my position in the pit. Today, the rehearsal is devoted to the understudies, only accompanied by the piano. Thus, comfortably seated in the balcony where the seats are certainly the most expensive, surrounded by a few colleagues, I could enjoy as a spectator what will soon be our Cyrano. The sets and costumes were, indeed, extraordinary. I was sure that the American audience, very sensitive to the visual aspect of the show, would applaud enthusiastically when the curtain is raised and the chorus sings: “Montfleury! Montfleury!”. This day, Bernard Uzan (the librettist) appeared in a regular suit and accompanied by a string quartet to announce: “Happy are those who....” This piano version did not do justice to music of DiChiera. Mark Flint’s orchestration is colorful, rich in sounds and unexpected effects such as the dialogue between the trumpets, but I could imagine how the music of the piano score would sound when performed by the full orchestra. The first Act, with so much going on and so many characters, is perhaps not the most engaging and I feared that the public might feel overwhelmed. But a friend, who is not a musician nor familiar with the plot, told me that he was, more or less, able to follow the intrigues of that first Act. As I feared, the “Tirade of the Noses” was disappointing. Each sections of the tirade is followed by an orchestral phrase, disrupting the rhythm of the tirade and softening the rapid fire of Cyrano’s retorts. Yet, I realized that I have more points of reference than the average person. I also wanted to highlight the great talent of Gaetan Laperriere in Cyrano (Le Bret in the actual cast). Actually, all the understudies’ voices were excellent, Evelyn Pollock as Roxane, and Benjamin Warschawski as Christian. The curtain fell for a change of scenery while the orchestra played the beautiful Interlude which deserves to be played in a concert hall. It was amusing to see the conductor directing the piano with such bravery! At the rise of the curtain, we were inside Ragueneau’s house: expected applause again! I pictured, this time, a Bruegel painting. Then, several duos followed, Cyrano-Le Bret, Cyrano- Roxane, Cyrano-Christian before the first intermission. This first act lasted more than one hour. Even with one change of scenery which provided a welcome break, the act moved on very slowly, I feel. A violinist who plays on stage to accompany Montfleury, at the beginning of the opera, shed his costume and wig before joining me. He agreed with me about the slow pace of the first act, but we were confident that the orchestra will shine, add rhythm and delight the ears of each spectator. During the intermission, I took great pleasure in explaining the story to my colleagues. “So who is dying?” “Well, first Christian, then Cyrano” Naturally, people die in an opera, but, this time, it is not the heroine who leaves a bereaved lover. If the first act was not convincing, from my point of view, the following two were more satisfying. By now, the story had started to captivate us and the balcony scene should please many, especially if the performances of Pop, Partridge and Sola continues to improve. Bernard Uzan (stage director) intervened during the Roxane/Christian marriage scene to improve the lighting. Mark Flint (conductor) teased the priest who has a countertenor part. “It’s to be closer to God” replied the “priest”. The third Act was the best in my view. Cyrano’s death scene was truly touching. I told a colleague that: “there will not be a dry eye in the audience” as I felt a little heartbreak myself too. The next rehearsal, with orchestra, will be in front of a small audience made up of friends and donors. There will be the testing ground for the reactions and impressions of a general audience. Critique by Danielle de Fauw, the boutique manager The music is beautiful; I, sometimes, heard influences from Puccini and Verdi. David DiChiera told me, recently, that, while composing during so many years, he would suddenly stop: a fragment of music sounded just like a known work or a famous aria. He thought that his knowledge of the musical repertoire was sometimes a handicap. His work has some very beautiful tunes for Leah Partridge (Roxane); it creates wonders. With her very lovely voice, she is the perfect Roxane and exquisite as a blonde (my feelings, too). Marian Pop is excellent as Cyrano. As for Christian, vocally he is excellent but perhaps a little too restrained in his acting, with not enough emotion. It could be a staging directive. After attending the entire performance, I agree with Nadine about the length of the first act. I also thought the orchestra overpowered the voices. Rehearsals are helpful to adjust those nuances. The first act seems to drag on, perhaps because the authors wanted to present all the facets of Cyrano’s character, little known to our audiences, apart from his nose! Also, Bernard Uzan (librettist) tried to include, even if shortened, many of the verses on bravery and gallantry almost know by heart in French circles! It is true that the American public dislikes sitting still and attentive for 65 minutes. I hope that their interest will not wane. Often, when we present an opera with lengthy acts, I see spectators wandering into my store which always amazes me.... Sometimes I tell them: “ Get back to your seat! You will miss the main aria!”. We can also rely on the action upon the stage, the set changes and the costumes to keep the attention of our spectators alive despite the apparent length of this act. I am sure that between the Detroit’s performances and those in Philadelphia, there will be changes made to the first and second acts. Since all the elements of success are present in the opera, only the less appealing fragments of scenes need to be shortened a bit. The costumes and sets are stunning. My nonprofessional eyes are pleased with the changes made to the sleeves of Cyrano’s costumes and the elegant additions to Roxane’s dress. (De Guiche, splendid work!) The only real concern I had was with the translation of the text for the subtitles projected above the stage. Admittedly, it is not an easy task to condense Ragueneau’s wild imaginings in a few words. Nevertheless, there is one verse, in particular, where a loss of meaning upsets me. In the last act, Cyrano replies to Roxane: “ No, no, my sweet love, I did not love you.” The translation summarizes: “ I did not love you” !! How can one drop the essential “my sweet love”? It completely changes the meaning of this declaration of love. When I think that, in my youth, my friends and I were brought to tears by those words. I suggested to Roberto Mauro that he could, at least, make that correction. But these are only rehearsals. On the evening of the Premiere, everything will be perfect and I know that the theater will vibrate. One last word, Nadine, which affects you more directly: you seem to have plenty of fun in the pit! Our audience arrived in dozens of buses, half of them young (and some very young), the other half seniors. We would finally know how a public responds to our opera. The house was packed. Thirty minutes before the start of the performance, we received a new list of corrections to our partitions. We were slightly annoyed because we needed to warm up and become focused. The corrections mostly focused on sound nuances. Aside from the cello solo which had to be played more forcefully (no problem! ), we had to play more softly when accompanying the singers. What a joy to hear the laughter of the children! They didn’t always laugh at the same scene as an adult would, but they were responding to the opera. At the final ovation, the audience literally exploded into applause and screamed their appreciation. It was interesting to note that, in our visually oriented era, as soon as the curtain fell, the children were totally oblivious of the interludes being played by the orchestra and drown the music with their raucous play. The understudies were performing and, as I already mentioned, were excellent. Gaetan Laperriere as Cyrano, was older than Marian Pop and, being a little more corpulent, seemed, to me, somewhat more credible. I loved his famous last words: “ My panache!” I was wondering how the public would know where to applaud since there were no tradition, yet. In two places, applause was expected and the orchestra expected this. In other places, attempts at planning for applause were quickly squashed. As I anticipated, I heard enthusiastic applause for the sets and costumes at each curtain rise. Do I need to mention that we eagerly anticipated the world premiere, on the following day? 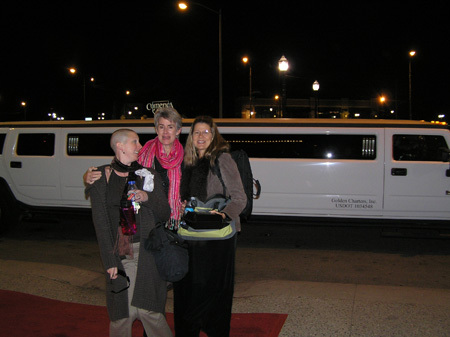 Already, last evening, the partying had began: as with every large production, a huge tent was erected in the adjacent parking lot to host a gala dinner honoring some 650 very important and generous donors. 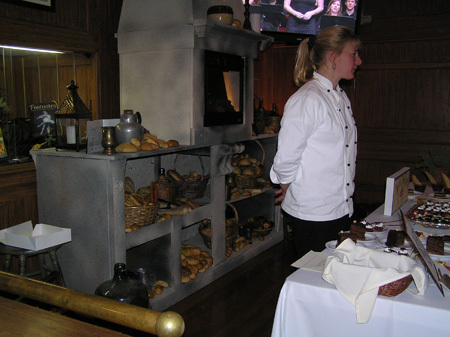 Naturally, the menu was supposedly French, as well as the entertainment featuring an accordion player to accompany a impersonation of Edith Piaf! The Michigan Opera Theater offered a small gift to each guest: the program adorned with a handkerchief to dab tears during the third act (the fifth in Rostand’s play). Every seat in the house is filled. Tonight, the best of Detroit, or rather the suburbs, is here as well as the international press. 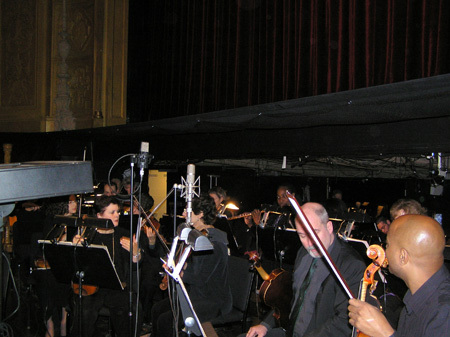 Traditionally, before each performance, David DiChiera, as the opera director, would address the audience, thanking the sponsors and announcing coming shows. 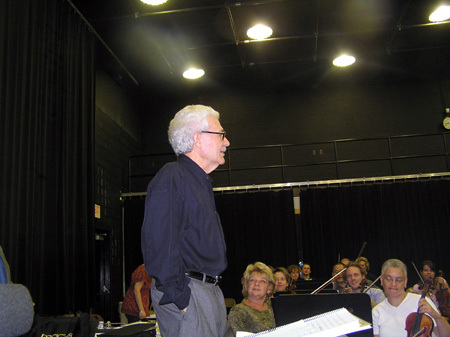 Last spring, he announced the 2007-2008 season with this words: “We are offering famous operas such as Traviata and The Marriage of Figaro and, also lesser-known operas by famous composers like Sonnambula and La Rondine.” He, then, stopped, leaving the audience guessing at his choice of words to announce his own opera, “ and an opera by a famous.....French author and a totally unknown composer!” Applause and laughter! Tonight, the president of the Board of Directors opened the 37th season thanking the sponsors. He described the enthusiastic expectation caused by tonight performance of Cyrano. Let the show begin! The conductor climbed on the podium; Mark Flint has never let his apprehension show and this night was no exception. 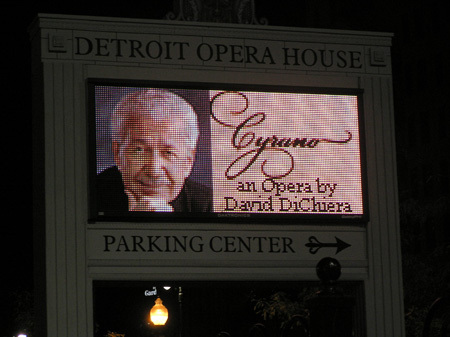 The audience knew him well since he has been coming regularly to Detroit since the inception of the Michigan Opera Theater. He was warmly applauded. The curtain rose after a short prelude by the orchestra; unrestrained applause at the sight of the spectacular sets and costumes. The choir, a dozen of extras (including children) and some of the main characters were on stage. During the performance, most of the applause fell at the place noted on the score; only once or twice did the applause come otherwise. Most likely, the breaks in the score will be altered to allow for the audience show of appreciation. At the end of the marriage scene, the string section had a tremolo (a trembling note at the very end of the bow, tiring to sustain for very long) to allow for the audience applause. The applause went on for so long that irresistible laughter broke out in the pit! Attentively focused on my score and on the conductor, I didn’t look at the stage but trusted that everything was, indeed, going well since the audience seemed happy. The final scene of Act I, before the curtain fell, showcased the chorus shouting “ to the gates of Nesle”, torches in hand and again the audience burst into applause. The first intermission was prolonged to accommodate a VIP reception on the second floor. I went to the shop to meet Danielle who showed me all the memorabilia she has up for sell on Cyrano. Bernard Uzan was signing his book (a novel) and told me he was well satisfied with this first act. Act II: The curtain rose on Roxane on her balcony, in a white dress (new round of applause). She begged Cyrano to ensure that Christian remains “prudent,......and faithful”. She also asked that “he writes her often”. “ That, I promise you” replied Cyrano, almost to himself. Before we throw ourselves into the third act, the conductor asked us to rise and we received a warm applause, signifying the success of the opera. The curtain rose on the siege of Arras, smoke and fog effects included. You could have heard a pin drop in the house. I thought: “Good! The applause won’t drown the music”. I was wrong! Although less exuberant, the audience applauded the sets and the lighting. It was, of course, their only way to show their appreciation for what they saw. But what about what they heard, the music? I remembered an Italian conductor. It was his first conducting appearance in the US. He was so shocked by the applause that showed respect for the orchestra only after the overture, ruining the music with their raucous applause that he would stop... and would make us start over again from the beginning, all the while, mumbling under his breath, in italian, about the uncouth American (it was the impression he projected, anyway!) Back to Cyrano: the music of the third act was certainly the most lyrical, going back to themes presented earlier in the opera. I was sorry that Cyrano had not been aged more appropriately. The final scene was still sublime. And the curtain fell one last time.... It was 9:44 pm. The audience was on its feet, bursting in applause and shouts. Suzanne Acton, chorus conductor, and the chorus presented their bows, followed by all the singers, with a new impetus of applause for the three main singers. 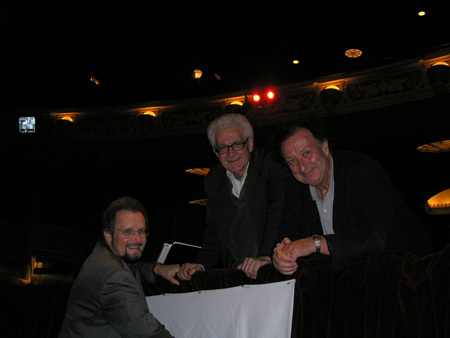 Then, it was the turn of Bernard Uzan (librettist/stage director), John Pascoe (sets and costumes) and Donald Thomas to collect their shares of bravos. At 9:48 pm, David DiChiera walked on stage and was applauded for six continuous minutes, better than a rock star! He was, visibly, very moved and a little clumsy in receiving his bouquets and in giving his greetings. At 72, what an unforgettable moment to receive such a standing ovation, such a tribute from this audience he carefully shaped over the years, and on this stage that would no longer exist but for persistent efforts (let us not forget that, thanks to him, the opera escaped demolition). On the evening of the world premiere of his first opera, the public thanked him and was happy for him. Delighted, he certainly was, floating on cloud nine but he was also realistic knowing he was, here, at home. 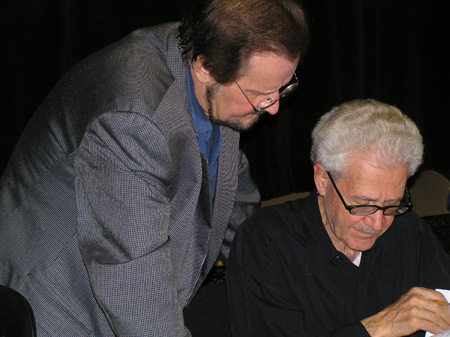 The ovation was as much a tribute to his far reaching friendships as it was to his talent as a composer. To measure the lasting success of “his” Cyrano, he will have to wait for the next performances and especially those scheduled in Philadelphia and Florida, without forgetting what the critics will write. But, on this evening of October 13, 2007, our “boss” could be proud of himself . He could take these verses by Cyrano and make them his own: “A yes for a no, a fight or write a verse! Working, neither for fame nor fortune, But for such dream, as going to the moon! Never writing a word that does not come from deep inside And remain modest, telling yourself: “my little one, Be satisfied with the flowers, the fruits and even the leaves If it is in your own garden that you pick them!” David DiChiera and Bernard Uzan have joined the long and prestigious cohort of authors and composers who have taken the road forged by Edmond Rostand, who has allowed its picturesque myriad of emotions to run through the world for over a century. All of us, members of the orchestra, singers, choristers, technicians are proud that Cyrano de Bergerac made a stop in Detroit and we are happy to have contributed to the success of this opera. I extend my sincere thanks to my friends and colleagues who helped me write this journal about our rehearsals of Cyrano, and also to Thomas Sertillanges for his valuable advice. Editor’s note: Dear Nadine, thank you for allowing us to experience first hand the creation of a new Cyrano. We wish this opera a long and prestigious career. And we thank also Florence Monnier for the translation. Publié le 17 / 10 / 2007.